Nothing brings a bride-to-be to tears like finding the perfect dress for the day she has dreamed about since she was a little girl. 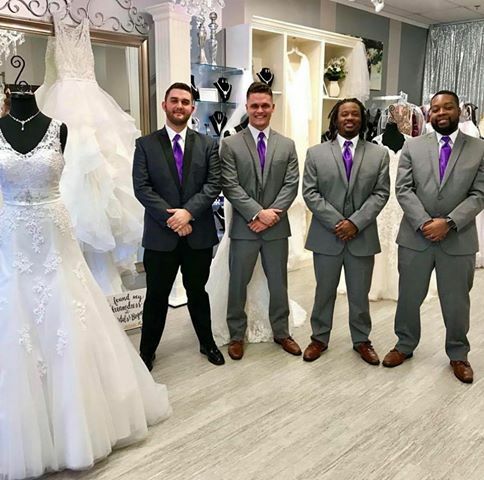 Long recognized as one of the best wedding and event DJ’s in East Tennessee, Mobile Beats Entertainment founder Kevin Knights brings the same level of 5 star excellence to his latest venture, Bridals and Beyond. 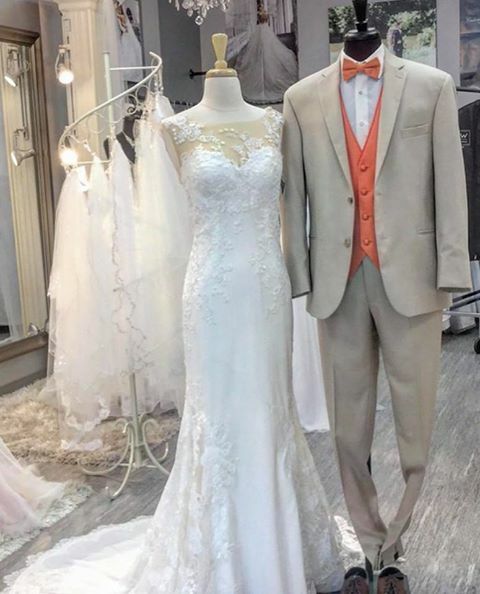 Located between Primary Care of Tennessee and Goodwill in the Food City shopping plaza, Bridals and Beyond boasts an inventory of 60-100 dresses at any given time in addition to suits and accessories. 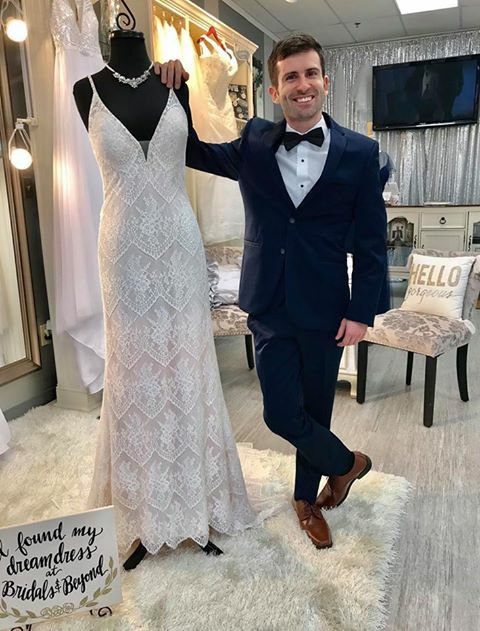 Adam: A Hardin Valley girl is looking to get married and she is ready to find her dress. What is her process? Kevin: We want to keep the focus on the brides. The best way to do that is to schedule an appointment for an hour to an hour and a half where the shop is all hers. We let her look around and she gets to pick all of the dresses that she wants to try on. We have two large mirrors with plenty of lighting so she can see exactly what she will look like. Adam: What is the best way to schedule an appointment? Kevin: We have a website (BridalsandBeyond.com) and you can always call (865) 249-7881. From our website and even Facebook, you can schedule an appointment and the amount of time. We are scheduled to be open until 7PM but can make special accommodations including Sunday appointments. Our system will send out a reminder the day before to confirm appointments. We remind them to bring the shoes that they are going to wear if they already have them. If they do not have shoes, we have an inventory to choose from, including dyeable shoes to match her dress. We also have accessory belts if the bride wants to add some bling to her dress. We recommend removing the belt and having the seamstress sew the jewelry directly onto the dress. Again, once she is here, the focus is on the bride, no pressure. We are aiming for that boutique feel where she has the entire store to herself. We never ask a bride what her budget is and then push her to buy a dress. We are given pricing guidelines from dress manufacturers. We aim to stay in the bottom of those guidelines to earn their business but also so they can afford easily forgotten necessities such as alterations and wedding veils. Adam: Do you Sell your dresses off the rack? Kevin: We do sell off the rack. A bride doesn’t want to wait weeks or months for her dress to come in; she wants to take it home that day. Also, what do you do if the dress you order isn’t the one that comes in, if the shade of cloth is different or one of the materials is changed. She doesn’t want close, she wants the dress she has on. This also allows us to keep fresh inventory. We receive it, we post it online (Instagram too), a bride comes in, tries it on and takes it home. Kevin: You know it’s the one when she comes out and looks in the mirror and just go to tears. Then they just don’t want to take it off! Adam: For someone unfamiliar with wedding dress shopping, what is your policy on dress returns? Kevin: There is a Tail Light return policy [once you get in your car and drive off, no more returns], which standard throughout the industry. With that said, we truly want the bride to be happy and focused on her special day and the marriage to come. I would encourage any bride who wants to make a change to call me. Call me and let’s start a conversation to see if we can work something out. Adam: What is a typical business day for you? Kevin: We usually have 5-6 appointments for brides a day and we see about the same number of men for suit rentals and sales. Adam: Do you rent wedding dresses? Kevin: No, dresses are for sale only. Adam: What are the latest trends in the wedding world? Kevin: Grooms no longer need to be associated with the bridesmaids; he needs to be associated with the bride. We can do that by matching his tie to the color of her dress…maybe white with a little bit of texture. Adam: What else is trending? Kevin: Shorter pants are trending. They are wearing their pants above the shoes because the guys want to show off their socks. We keep some fun socks in stock for that very reason. Adam: Let’s talk about Mobile Beats (MobileBeatsEnt.com), the disc jockey side of your business. Are you staying busy? Kevin: We are booked for 22 weddings in September and October. We DJ about 120 weddings a year. Adam: Wow! That makes for some busy weekends. Kevin: We are available weeknights and weekends because we do a lot of destination weddings in Gatlinburg and Pigeon Forge on Mondays through Thursdays. Adam: How do out-of-towners hear about you? Kevin: Online reviews. One of the reasons why the reviews are so high is because of the online service. They can log into the website, all of the planning forms and music are there in front of them. So wherever they are, they can enter it in. When she add songs, enters in her first dance, I get an email and this keeps us on the same page throughout the process. Adam: Have you earned any professional awards? Kevin: Yes, we have earned several over the years. Most recently we received the Wedding Wire’s 2018 Couple’s Choice Award. This makes the 5th year in a row we have been recognized for excellence in the wedding industry. Adam: Music has changed over the years. What if you have a song that you love but grandma may be offended by the lyrics. Kevin: We always like to offer a clean version of a song to our clients. We will search for the cleanest version out there or we can edit the song to take certain words and play them backwards. Adam: What are some common questions that you get or should get from clients? Kevin: Do you have back up equipment? Do you have a mic for the officiant? Can you mic the groom? Yes! We can do all of that and we do it wirelessly. All of our lighting around the room is also wireless. No one wants to see or trip over cables and power cords. All of our equipment runs off of batteries with 22 hours of power. We can even light up the underneath of every table in the room without using a single cable because they all run on battery. We can create any color you want with our LED lighting. If you want your wedding colors around the room, we can do that. Fuschia? No problem! We have back up equipment, back up laptops, back up controllers, back up speakers. We want the event to be perfect. If equipment goes down, we make sure no one even notices because we have the new piece in place so quickly. When you are prepared for the ‘what-ifs’, it makes for a great day. Same with songs. We have the playlist backed up on flash drives and laptops so we can boot it up without missing a beat. Adam: Do you have any guiding principles for your business? Kevin: When you’ve been in the wedding business for 24 years, you’ve got to give your customers, your clients, your bride and groom the attention they deserve from the first day they walk in the door. That’s what it’s all about. We will send you the Hardin Valley Coupon Book.